Clear Creek Canyon, 2nd edition. Kevin Capps is the author. Fixed Pin is the publisher. 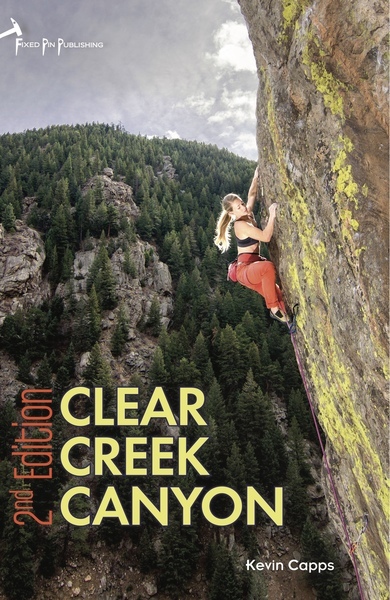 In 2017, a 2nd edition for the Clear Creek Canyon guidebook came out. The 2nd Edition to the Clear Creek Canyon guidebook by Kevin Capps is now on the shelves. Find it at most gear shops or online at https://www.fixedpin.com/products/rock-climbing-clear-creek-canyon. 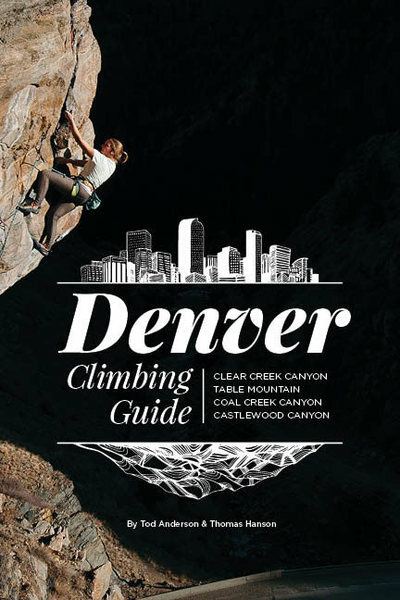 Sharp End Publishing has recently released a new Denver Climbing Guide that includes comprehensive coverage of Clear Creek Canyon, North Table Mountain, Coal Creek Canyon (the legal climbs), and Castlewood Canyon. It has many more routes than even the latest book. Clear Creek Canyon is one of the primary destinations for Front Range sport climbers. This comprehensive and thorough guide is long overdue given the recent surge in route development. Local activist and route developer Darren Mabe brings his love and knowledge of the canyon to this full-color work. Mark Rolofson, Free West Rock Guides, 2006. The latest edition of Mark Rolofson's guide to Clear Creek Canyon is now available. It follows the same format as Rolofson's previous guide to the area, with topos and written descriptions of the routes and a few photographs. Rolofson's topos are not very artistic, but they do give a fairly accurate portrayal of the bolt lines and crux moves. This guide contains more than 420 routes, with over 200 new sport routes never before documented in any other guide. The book can be purchased at Neptune Mountaineering in Boulder. by Mark Rolofson, Free West Rock Guides. A good book for people who want to focus on sport climbing. Rolofson makes it easy to figure out where the routes are, usually. Topos and written route descriptions; a few photos. The most complete guide to Castlewood Canyon; describes over 300 routes including 100 sport routes. "Golden Rock Climbs" published September 2010. Includes detailed descriptions, topo drawings and many black & white photos. Also contains information to the four quarry walls on North Table Mountain ( Sea Cliffs, Crater Crag, East Quarry & South Quarry). It is also the only guidebook containing information to the sports climbs near Dude's Fishing Hole in Golden Gate State Park. It retails for $20.00 and is currently available at Front Range climbing shops including Neptune Mountaineering, Bent Gate Mountaineering, & Wilderness Exchange Unlimited. The Black. 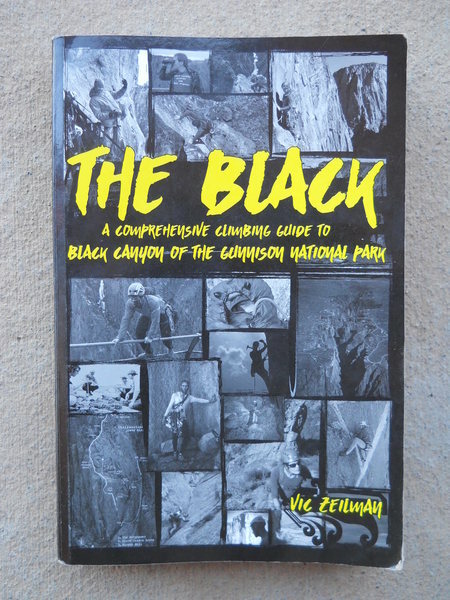 A Comprehensive Climbing Guide to Black Canyon of the Gunnison National Park is available. At 512 pages, this full color guidebook is packed with dozens of new lines, detailed approach information and pitch by pitch descriptions, pictures of the walls, first ascent stories, historic photos and action shots, ten essays, and hand drawn topos for some of the better routes in the Black. A huge debt of gratitude goes to Josh Wharton, Jonathan Schaffer, Ed Webster, Topher Donahue, Kent Wheeler, Steve Levin, Jeff Achey, Robert Warren, Jimmy Newberry and so many others who helped make this book happen. A new guide to the Black that is wonderful. It is a very refreshing guide. Get it! There is a new softcover guidebook out which is described as "a celebration of Leadville area rock climbs. It features over 300 climbing routes and 150 boulder problems. Some of the areas include Monitor Rock, the East Side of Hagerman Pass, Popular BV Crags and Boulders, and the Finnback Crags in the Mosquito Range." It is 6 x 9 inches and is 178 pages long. The cost is $35. "The quintessential urban crag, Golden's own North Table Mountain provides a great place to catch some after work cragging, or a sunny place on a cold winter's day to get outside on the stone. This guide contains up-to-date information on over 300 routes in three separate major areas. Dozens of individual and overview pictures have been assembled in addition to navigation way-points, making navigation a snap in this digital only climbing guide." Tod Anderson uses "all the proceeds from [his] guidebooks for new routes and maintaining existing routes." This highly anticipated and long overdue book is Table's first color guide. Virtually every single route is photographed for easy identification and the banner across the top works like a flip book  the yellow box moves across the pages, showing where you are along the cliff line so no more walking up to the base with the confused look on your face going "ok so where are we?". Not only that, but routes are color coded for easy identification  sport routes are yellow, trad are blue, and boulder problems are green, making the book extremely user friendly. The book is fully comprehensive, including 284 routes and a smattering of boulder problems, nearly 100 of which have never been documented before, including the previously undocumented South Quarry area. The authors also climbed every single route to ensure accuracy and to normalize route grades/quality ratings. Part of all proceeds from the book goes to the Access Fund. by Peter Hubbel, Chockstone Press, 1997. "Overlooked or ignored for many years, Devil's Head has become one of Colorado's premier sport climbing destinations. Over 100 crags, spires and walls contain some of the best granite in the western U.S., and the 400+ routes are less than one hour from downtown Denver." This guidebook has color photo-topos and hand-drawn topos, great color action shots, history, and solid approach beta. It is a comprehensive, full color guidebook for the entire area. It should be noted that ALL OF THE PROCEEDS from this book go back to the climbing community primarily in the form of new routes and maintenance of existing ones. About 20-50 new routes are established every year by the Head crew. Support their efforts and expenses with a purchase of Rampart Range Rocks! Rampart Range Rocks is available at most Front Range mountain shops, like Wilderness Exchange, Bent Gate, and Neptune's. 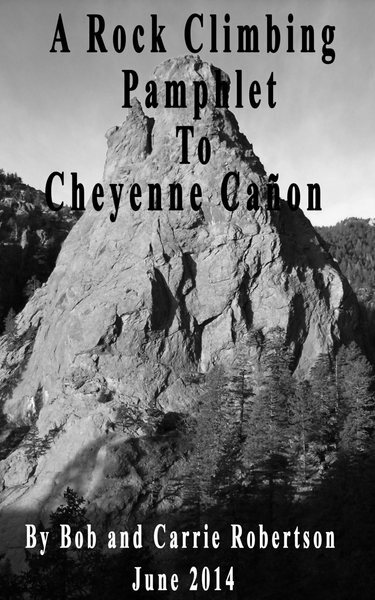 A Rock Climbing Pamphlet To Cheyenne Canyon. 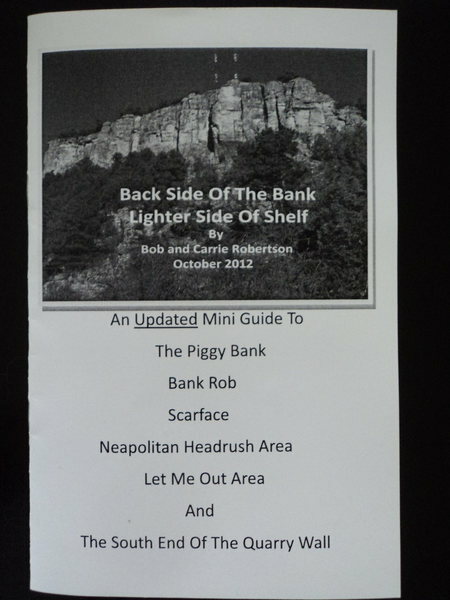 This is a climbing guide pamphlet put out by Bob & Carrie Robertson in June 2014. It covers this granite rock canyon just west of Colorado Springs and includes ~100 routes, 16 crags, and 1 boulder. It includes mostly the better quality routes up to 3 pitches in length, although most are 1 pitch / half rope routes. This guidebook covers mostly sport climbs, with 12-13 TRs, 21 trad, and ~5 mixed gear/bolt routes. The current price on the back is listed at $6.95; however, the website lists a sale price of $5.95 right now. OK, it is time to come clean, The Wild Wild West guidebook, best known for its desert wingate climbs on Carpenter Ridge, Red Rocks, 16Z, Psycho Tower, EE22 Rd. etc., is officially out of print. If you have a copy, save it in a safe place. There will most likely not be a reprint of this guide. I will, however, in my spare time, work on a guide to these areas for the net. This may take some time to complete, no holding you breath. Updated guide to Elevenmile Canyon. Bob D'Antonio, Falcon Press, 1996. A bit dated; there has been a lot of new route development in Elevenmile Canyon since this guide was published. Nevertheless, it gets you to the rocks and describes the older routes with photos, topos, and written descriptions. Badger Mountain Area is covered in this pamphlet guidebook. It includes crags in the 9,000-10,000' elevation level. Ussen, Feral Petunia, Chicken Rock, Spruce It Up, and West La Salle (Turner Rocks and Duck Rock) are included in this guidebook with 101 routes listed. Spruce It Up has 7 routes here, all bolted routes. Feral Petunia has 39 routes here, most all are bolted. Most are 1 pitch lines, but there are some 2 pitch lines covered. Valley of The Chickens includes 20 routes here, bolted, mixed, and gear routes. There are both single and two pitch routes. Ussen has 5 routes listed, all bolted routes, mostly 1 pitch. West LaSalle includes Turner Spike, Turner Blade, and Duck Rock with 18 routes, nearly all of which are bolted, 1 pitch lines. This pamphlet has 11 crags and 69 routes from 5.5 to 5.12. 56 are sport routes (down to 5.6), 3 are trad routes (5.8-5.9), and 10 are TRs (all but one are 5.6 or less). Most of the climbing is sport routes under 5.10. There is a toprope wall. Over half of the rocks have less than a 10 minute approach. With fishing, mountain biking, hiking, free and pay campgrounds, this is a great summer climbing area for the whole family. It costs $7.95 for the pamphlet. by Bob and Carrie Robertson. Climbingpamphlet.com. The Sunny Side of Voyager covers the south-facing routes of this scenic area along Oak Creek south of Canon City in the Wet Mountains. It's a warm and windy area. Areas covered in this guidebook are: Flintstone Manor, Upper Voyager, Lower Voyager, Runnel Rock, Arrow Spire, Enterprise, The Lower Deck, and Halla Deck. Within are descriptions for 46 routes that range from 1-5 pitches. 39 of these are sport routes, 3 are gear, 2 are top ropes, and 2 are listed as projects. It is on sale at www.climbingpamphlet.com for $9.95. This is a newly published pamphlet written on an area, Manassa Rocks, not yet covered in the MP.com database that lies southeast of Alamosa, a half hour away and a little more than an hour from Taos. In this 12 page black & white guide, there are 31 routes on 7 crags described that are primarily bolted sport climbs; however, there are also 6-7 trad lines and a few top ropes. These are a mix of 1 and 2 pitch lines. Some of the 1 pitch lines are longer than 100 feet. This area sounds like an interesting place to check out. The current price listed is $5.95. Bob D'Antonio, Falcon Press, 1999, 3rd edition. Short, steep, and well-protected is the name of the game on San Luis Valley's high-quality volcanic cliffs. Known for its excellent aretes and stemming corners, the Valley is one of the most popular sport climbing areas in Colorado. Come ready to pull down on pockets, edges, and huecos, as well as sample some superb crack routes. Now in its third edition, Rock Climbing the San Luis Valley describes more than 300 routes at Penitente Canyon, the Rock Garden, Witches Canyon, Shaw Springs, Sidewinder Canyon, and La Garita Wall. Completely revised, this guidebook contains updated route information and now details the canyons using photo topos and overview maps. Also included is a bouldering section that will guide you to many of the Valley's stellar problems. There is a newly updated mini-guide to the back side of The Bank. Back Side Of The Bank. Lighter Side Of Shelf. by Bob and Carrie Robertson. It is written by Bob & Carrie Robertson and came out in October, 2012. The South End Of The Quarry Wall. This includes black and white photographs / topos for 83 sport routes with FA information. It is available through www.climbingpamphlet.com for $7.95. by Fred Knapp, Rick Thompson, and Rich Aschert, Sharp End Publishing, 2005. Finally, a comprehensive guide to Shelf Road with over 900 plus routes, the new guide covers: The Gallery, Sand Gulch, Dead Colt, The Bank, The Dark Side, The Vault Area, Cactus Cliff, Spiney Ridge, The Gym, The North End and the Great Black North. by Rick Thompson, Sharp End Publishing, 2000. This guide to Cactus Ciff and Spiney Ridge is outdated, and has been superceded by the new Shelf Road Rock guidebook by Fred Knapp, Rick Thompson, and Rich Aschert. by Mark Van Horn, Falcon Press, 1999. Out of print though usually available used from online retailers. Newly updated guide to a premier Colorado limestone sport crag outside of Canon City. Includes areas recently acquired by the Access Fund. Knapp's guide does include additional areas that Van Horn doesn't, but those areas are currently private property and have access issues. Van Horn's is a good guidebook, considering the thorough topos, pictures, history, directions and .... route descriptions? Well Van Horn is far from verbose with his route descriptions. Get used to the following words: devious, technical, continuous, strenuous, thin, sharp, and sequential. Mathematically Van Horn has found the orthoganol set of route desciption words, the smallest possible set of words to adequately describe the routes. And darn tootin, it works, leaving just enough to the imagination. If you're considering getting a guide to Shelf, then this is a good one. Includes The Gallery, Sand Gulch, Dead Colt, The Dark Side, The Bank, The Vault, Cactus Cliff, Spiney Ridge, & The Gym. This guidebook was published in 2000. It has one of the better descriptions for the Wild West/West Bank/Secret Crag areas. You can contact them at falcon@falcon.com. Mark Rolofson, 2010, Free West Rock Guides, P.O. Box 732, Boulder, CO, 80306-0732. This guidebook includes detailed descriptions, topo drawings, and many black & white photos for Dude's Throne, Little Dude, and The Grendel. Also, it contains information to the four quarry walls on North Table Mountain (Sea Cliffs, Crater Crag, East Quarry & South Quarry). It is currently the only guidebook containing information to the sports climbs near Dude's Fishing Hole in Golden Gate State Park. It retails for $20.00 and is currently available at Front Range climbing shops including Neptune Mountaineering, Bent Gate Mountaineering, & Wilderness Exchange Unlimited. This guidebook includes detailed descriptions, topo drawings, and many black & white photos for Dude's Throne, Little Dude, and The Grendel. Also, it contains information to the four quarry walls on North Table Mountain (Sea Cliffs, Crater Crag, East Quarry & South Quarry). It is currently the only guidebook containing information to the sports climbs near Dude's Fishing Hole in Golden Gate State Park. It retails for $20.00 and is currently available at Front Range climbing shops including Neptune Mountaineering and R.E.I. The South Platte - Northern Volume -- The first of a two part series, the northern volume covers everything from Conifer to Buffalo Creek. This includes the Cathedral Spires, the Castle, Top of the World, Pine, the Malay Archipelago, Devils Head and many more areas. Of the 3,000 routes in the South Platte, 1600 of them are described in this volume, from 30 foot clip-ups to 1300 foot multipitch epics. As one of the oldest climbing areas in Colorado, the Platte has been steeped in local lore and legend for more than a century. Routes like Center Route (5.9) and Wunsch's Dihedral (5.11b), widely regarded as two of the best multipitch routes in the state, merely represent the tip of the iceberg. With the addition of hundreds of new routes, previously undocumented domes and crags, and better beta for the old classics, areas formerly shrouded in mystery, discussed in hushed conversations and documented on bar napkin topos will become accessible to anyone ready for an adventurous day of climbing. The release of this upcoming color guide chock-full of description photos and pitch-by-pitch route breakdowns will eliminate the navigational debacles and frustrating epics created by sketchy info and hand-drawn topos. Climbers can now stop the pointless bushwacking and start exploring the Plattes hidden gems. This updated comprehensive climbers guide to the entire South Platte region includes almost 1,500 routes with completely new topo maps and new route information. Including the following areas: Pine, Cathedral Spires/The Dome, Malay Archipelago, Buffalo Creek, Top of the World, Noddlehead, Rampart Range Road North and South, Wigwam Creek, Helen's Dome, Turkey Rock, Big Rock, and Tarryall. The South Platte region of Colorado is home to many classic granite crags from multi-pitch spires to choice single pitch splitters. Early Platte pioneer Ken Trout is famous for his excellent topos of this amazing area. By Jason Haas and Ben Schneider, Fixed Pin Publishing, 2008. Craig Luebben started this project almost 20 years ago when he published a Greyrock climbing guidebook (1991). During his time in Fort Collins, Craig contributed many first ascents to the canyon. With Craigs support, Ben Scott and Cameron Cross of the NC3 spearheaded the effort to release this book online and free of charge to the climbing community. Tragically, on August 9th, 2009, Craig died in the North Cascades while training for an AMGA guides exam. While Craig could not be a part of the final stages of the process, the NC3 released Poudre Canyon Routes Select as a free download last fall. After Craigs death, his contributions to the climbing community are helping fulfill a dream he himself never realized - seeing his daughter Giulia attend college. 100% of the profits from the sale of this book will be donated to the Craig Luebben Memorial Fund, and will specifically be invested in a CollegeInvest 529 Plan for his daughter. Thanks to a generous donation for the printing costs, every penny you spend on this book will go into that fund. Purchase: Click here to quickly and easily buy it directly from the publisher. Eldorado Canyon - with its red rock walls, cascading creek, and dazzling lichen, it is the crown jewel of Colorado climbing. Intricate movement and cerebral climbing draw visitors from around the world. Adventure awaits on the multi-pitch outings and distant crags, while roadside routes greet the afterwork crowd. Few areas offer the ambiance and grand atmosphere of this magical venue. by Richard Rossiter, Falcon Press, 2000. This is the newest, best guide in print that covers Eldorado Canyon. EDIT: No longer the newest or best... See Steve Levin's book. Guidebook for Empire from Fixed Pin. These are great books! Includes detailed descriptions, topo drawings and many black & white photos. Also contains information to the four quarry walls on North Table Mountain ( Sea Cliffs, Crater Crag, East Quarry & South Quarry). It is also the only guidebook containing information to the sports climbs near Dude's Fishing Hole in Golden Gate State Park. It retails for $20.00 and is currently available at Front Range climbing shops including Neptune Mountaineering and R.E.I. Bob D'Antonio, Wolverine Press, 2009. This guidebook is the new standard for Boulder Canyon -- excellent binding, great color photo topos, easy identification of sport routes (in blue) and trad routes (in red). Essays by Royal Robbins, John Gill, Pat Ament, Jim Erickson, Richard Rossiter, and others. Covers Boulder Canyon, Lower Dream Canyon, and Upper Dream Canyon. Has hundreds of new routes not in any other guidebook. The one book to have if you're going climbing in Boulder Canyon. The companion to "Volume II: The Upper Canyon" is finally available. It covers sport climbs (and a few trad climbs) in lower Boulder Canyon, from Eagle Rock to the Boulder Falls area. Also included are Lower and Upper Dream Canyon. The volume includes more than 525 climbs, with 160 routes never documented in any other guidebook. Plotinus Wall in Lower Dream Canyon is documented for the first time in a printed guidebook. Many routes on Midnight Rock in Upper Dream Canyon are also documented for the first time. Not included are predominantly trad crags, such as the Dome, Elephant Buttresses, Brick Wall, and Cob Rock. This is the typical Rolofson guide, with topos and route descriptions, but very few photos. The topos aren't artistic, but they are good enough and are fairly detailed, showing accurate bolt counts and locations of the crux moves. Sport climbers wanting to check out newer routes in lower Boulder Canyon, Lower Dream Canyon, and Upper Dream Canyon should definitely buy this book. Available at Neptune Mountaineering in Boulder. Mark's old guide to Boulder Canyon Sport Climbing. Covers the entire canyon. Topos and written routes descriptions; only one route photo. The topos aren't very artistic, but they are good enough. This book is out of print. Rolofson's new Boulder Canyon guides have been published as a two-volume set. Volume II, covering upper Boulder Canyon, was published in July 2005. Volume I, covering lower Boulder Canyon, and Lower and Upper Dream Canyon, was published in May, 2006. Mark Rolofson, Free West Rock Guides, July 2005. Covers sport climbs in the upper half of Boulder Canyon above Boulder Falls, from the Bowling Alley to the Sport Park. A few trad climbs are also included. Topos and written route descriptions; only one photo. Covers new routes on crags at the Sport Park and elsewhere; has more than 500 routes, including 140 routes not documented in any other guidebook. The topos are not very artistic, but they are good enough. The bolt counts on routes are pretty accurate. Unfortunately, the book is incomplete, ignoring several crags developed by Richard Rossiter since 1998. Absent from the book are Sleeping Beauty, Solaris, and Wizard Rock, all with excellent sport climbing. MountainProject.com and Rossiter's boulderclimbs.com are your best references to these areas. Also missing are new sport routes developed in 2005 on Avalon, Trout Rock, Broken Rock, the Overlook, Myth Rock, and others. MountainProject.com is your only reference for these routes. they're open to interpretation, and as far as sport climbing goes, the guide is becoming outdated. by Richard Rossiter, Falcon Press, 1999. The canonical book of climbs in Boulder Canyon. Rossiter has been climbing in Boulder since approximately 1632, and this huge tome of routes proves it. The only thing lacking is photos - his drawings make it difficult at times to pick out routes on the rock. Simply put, RIfle Mountain Park is the best limestone sport climbing destination in North America. Confined to a narrow box canyon two miles long, RMP contains an unbelievable concentration of standard setting climbing. Long known for its overhanging enduro-fests, the canyon has seen a revitalization of route development, with the majority of the new routing taking place in the moderate grades of 5.11 and under. Rifle Mountain Park and Western Colorado Rock Climbs also details over 20 newly developed and never before published crags in Glenwood Canyon, the Frying Pan River Valley, the Crystal River Valley, and around Main Elk Creek near New Castle. With updates of the classic spots like the Fortress of Solitude and the Redstone Boulders, as well as details about the soon-to-be classic crags of the Narrows near Redstone, the Skillet above Basalt, and Lime Creek above Eagle, this guidebook is a must have for any Colorado rock addict. Rifle Mountain Park and Western Colorado Rock Climbs also showcases the region's climbing with hundreds of color photographs, including stunning action shots from pro shooters like Keith Ladzinski, Celin Serbo, and Tim Kemple, as well as the photos of BJ Sbarra. Here is a complete list of crags covered within: Rifle Mountain Park, Rifle Arch, Main Elk Crag, the Pup Tent of Solitude, the Fortress of Solitude, the Puoux, Superpuoux, the Homestead and Gray Slabs in Glenwood Canyon, East Canyon, No Name Canyon, the Neighborhood, the Grizzley Creek Wall, Fountain Buttress, the Shoshone Stones, Dead Horse Crag, Surgery Buttress, Seven Castles, the Skillet, Hagerman Pass, Lime Creek, the Narrows, Redstone Boulders, Coal Creek Crag, and the Coal Creek Boulders. by Hassan Saab, Sharp End Publishing. The first and still the best guidebook to America's finest limestone area. With excellent topos, written descriptions, and historical information, this is the book of choice. Dave Pegg, BJ Sbarra, Jeff Achey, and Nate Adams, Wolverine Publishing, published June 16, 2008. By Dave Pegg, BJ Sbarra, Jeff Achey, and Nate Adams. by Dave Cooper, Colorado Mountain Club Press, 2005. Colorado Scrambles: A Guide To 50 Select Climbs In Colorado's Mountains (Cmc Classics) (Paperback) by Dave Cooper "Scrambling encompasses the realm between off-trail hiking and technical climbing..."
The Colorado Mountains provide endless opportunities for climbers, and now in the latest installment of the Colorado Mountain Club's Classics series, Dave Cooper has compiled this guidebook that offers complete descriptions for some of the best scrambling throughout the state of Colorado. Rather than use the height of a peak or its region, this book explores the quality of the scrambling routes. Written for the experienced mountaineer interested in not only bagging summits, but also in a challenge, rock quality, position and remarkable routes. You'll find scrambles in the San Juan Mountains, Sangre de Cristo Range, the Park Range, the Gore Range, Tenmile Range, The Mosquito Range, the Sawatch Range, the Front Range, and the Elks. This guidebook contains detailed information on what makes the route unique, how to start the climb, access issues, crux sections and route finding tips. Extensive photographs take the scrambler along the route for clarification, and the book is fully GPS enabled to identify critical locations on both the approach and the climb. Detailed topographic maps make routes easier to locate. by Ben Bruestle, Sharp End Publishing, 2003. The Wet Mountains, a hidden gem of Southern Colorado climbing, boast steep sport granite, multi-pitch adventure climbs, ice and historic sandstone bouldering. Included in this new guide are the popular sport crags of the Tanner Dome massif. by Dave Pegg, Wolverine Publishing. The only up-to-date guide to America's premier sport-climbing destination: Rifle Mountain Park in Western Colorado. Also covers The Fortress of Solitudehome of Flex Luthor and Kryptonite Puoux and other sport-climbing, bouldering, and traditional climbing areas in Western Colorado. by Phillip Benningfield, Sharp End Publishing, 1999. This is the Bible of bouldering in Colorado. From High Country hide-outs to the popular Front Range crags, Benningfield's meticulously researched guide details thousands of boulder problems. A must-have guide for any local or Colorado visitor. Also available at Sharp End Books. The legend Bob Horan covers many areas with maps and descriptions. A solid guide that includes extends north to climbing in Fort Collins and south to Castlewood Canyon State Park. The pictures of the routes are all drawn, and generally reliable. While the guide is comprehensive in terms of route volume, there is no description for the routes or subjective rating. by Stewart M. Green, Falcon Press, 1995. This guide likely incorporates the most climbing areas in Colorado of any other guide. The guide also makes routes relatively easy to identify, with good pictures and descriptions. However, each area is given an overview, often leaving out a large portion of routes within a specific area. by Fred Knapp, Sharp End Publishing, Second Edition, 2001.
ready to hop into leading. ARKANSAS VALLEY CLIMBING including CAMP HALE describes the best of central Colorado rock climbs! Areas include Camp Hale, the Chalk Cliffs and Cecil Ville Slab north of Leadville, the Rock Garden south of Granite, the Buena Vista Crags, Holy Water Wall on Cottonwood Pass and Coaldale Colorado. Tom Perkins, Aspen Climbing Guides. Independence Pass Rock Climbing II describes all climbing and bouldering areas between Aspen and Twin Lakes Colorado. Included are maps, photos and route descriptions to over 700 climbs and boulder problems. Rock climbing and bouldering guide book for Independence Pass. This book includes over 500 climbs and boulder problems located between Aspen and Twin Lakes Colorado. Tom Perkins, Aspen Climbing Guides, 1997. A guide filled with locations and descriptions of old classics and the newest hot spots. Peter Hubbel, Falcon Press, 1999. Covers South St. Vrain Canyon, Golden Gate Canyon State Park, Buttonrock Dam, Zebra Rock and Pinecliffe. Photo and topo format, no written route descriptions. Includes quality ratings. Bernard Gillett, Earthbound Sports, 2001. Covers rock, ice and mixed alpine routes in the high peaks of Rocky Mountain National Park. Areas covered include: Arrowhead, Cathedral Spires, Cathedral Wall, Chiefshead, the Diamond, Half Mountain, Hallett Peak, Loch Vale, Longs Peak, McHenrys Peak, Moraine Park, Mt. Alice, Mt. Meeker, Notchtop Mountain, Otis Peak, Pagoda Mountain, Pilot Mountain, Powell Peak, Spearhead, Ypsilon Mountain, and more. The topos aren't as artistic as Rossiter's, but the information is a little more up-to-date. Richard Rossiter, Falcon Press, 1996. A comprehensive guide to the many climbing routes of Rocky Mountain Park. Rossiter has drawn many wonderful topos of the major cliffs and routes, including: The Diamond, Spearhead, Petit Grepon, Hallett Peak and Chief's Head. Includes ice climbs as well as rock climbs. 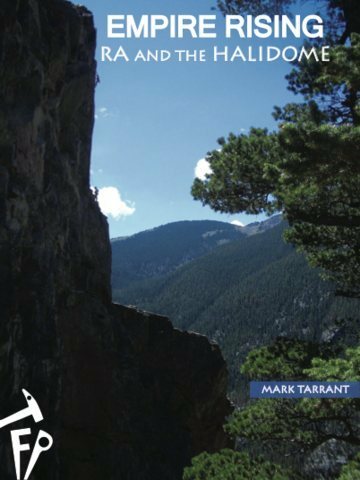 This is the most comprehensive climbing guide to to the low-elevation cliffs surrounding Estes Park, the eastern edge of Rocky Mountain National Park, and surrounding National Forest lands. In this guide you'll find topos and detailed descriptions of multi-pitch traditional crags, slabs, sport areas, toprope areas, and boulders. Areas covered include: Alligator Rock, Big Thompson Canyon, Cedar Park Slab, Combat Rock, Cow Creek Canyon, the Crags, Deer Ridge Buttress, Deville Rocks, Fall River Road Crags, Glen Haven Picnic Area, Ironclads, Jurassic Park, Kinnikinnik Crags, Lumpy Ridge, MacGregor Slab, the Monastery, Palisades, Piz Badille, Prospect Mountain, Sandbeach Rocks, Spur 66 Crags and more. The topos aren't as artistic as Rossiter's, but this book covers areas not in Rossiter's book, such as the Monastery, Jurassic Park, and the Ironclads. Richard Rossiter, Falcon Press, 1998. A rock climbing guide to 650 routes: Prospect Mountain, Twin Sisters, Lily Mountain, Fern Canyon, Fall River Canyon, Lumpy Ridge, Cow Creek Canyon, and Dry Gulch, Big Thompson Canyon. With detailed maps, topos and written descriptions for the routes in the lowlands of Rocky Mountain National Park. Not as comprehensive as Gillett's guide (does not cover the Monastery, Jurassic Park, or the Ironclads), but good topos and route descriptions for the areas that are covered. Stewart M. Green, Sharp End Publishing, 2004. Red Rock Canyon Open Space is Colorado Springs newest park and climbing area. This hidden canyon lined with towering sandstone walls, offers over 90 bolted sport routes on slabs and steep faces. The park offers quiet, serenity, isolation and some of the best climbing adventures in Pikes Peak Country. Mark Rolofson, Free West Rock Guides, 1997. Another Garden of the Gods guide. Contains topos, written route descriptions, and a few photos. by Bob D'Antonio, Falcon Publishing, 2000, Second edition. Completely updated and revised, this guide now offers extensive written descriptions of the routes, complemented by clear maps of the area and photos of all formations. Locals and visitors alike will find this book to be an indispensable resource when planning their next climbing adventure at the Garden of the Gods. Pat Ament and Cleve McCarty, 1995. History filled, and from one of the original Boulder masters, Ament's book is a classic. A great book for the Boulder area--great maps and descriptions. by Fred Knapp and Mike Stevens, Sharp End Publishing, 1998. The best climbs of Boulder, Colorado are included in this select guide. From Eldorado Canyon's multi-pitch classics to the sport climbs of Dinosaur Mountain and Boulder Canyon; from slab-happy cruises in the Flatirons to the city's famed bouldering, this guide covers it all. by Richard Rossiter, Chockstone Press, 1996. A summary of the better routes in Rossiter's vast database. It has more pictures with routes indicated on them than in hie compilations, which is nice. It covers just about every area around Boulder. by Bob Horan, Falcon Press, 1995. ISBN: 0-934641-96-X. this is a good one, lots of detailed maps. By the way the cover pic. is at Carter Lake. Tom Perkins, Aspen Climbing Guides, Annually updated. Guide to Monitor Rock sport climbing and gear protected routes. Covers Upper Dream Canyon. This book is out of date. Rossiter's "Rock Climbing Boulder Canyon" is a better reference to Upper Dream Canyon. The second book in three that will replace Rossiter's classic Boulder Climbs South and North. Again, Rossiter's greatest strength is the sheer number of climbs in the book. However, his tendency to be sparse in descriptions and his abstract drawings make actually finding the route when you get to the rock a challenge.